Discussion in 'Toilet Forum discussions' started by Terry, Jul 19, 2008. 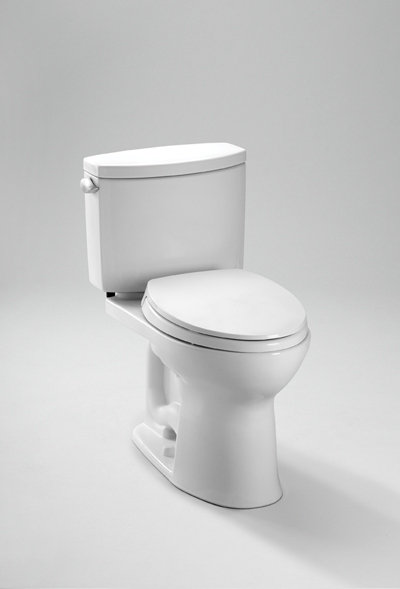 Toto has a new model called the Gwyneth with the WaterSense Ecoflush. 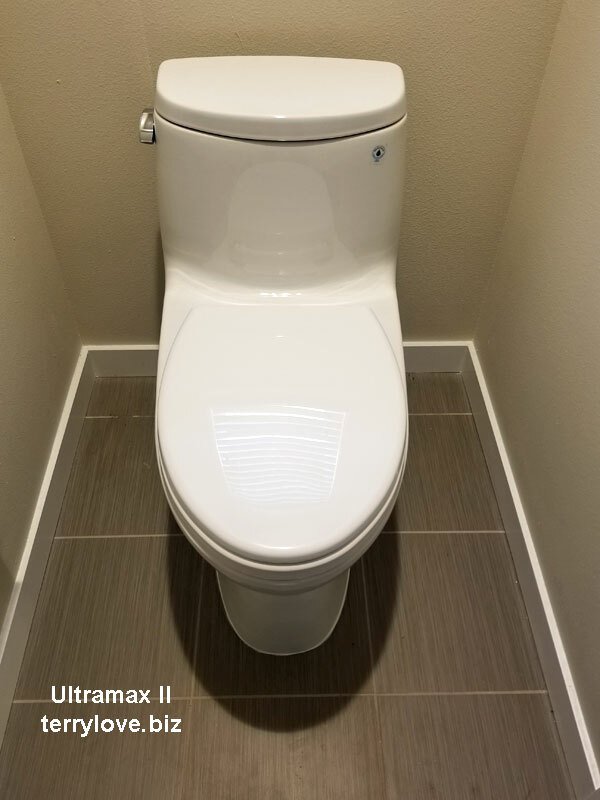 Ultramax II with C200 Washlet installed. Out of the box, the Ultramax one-piece is a pop and drop installation. Pop the box, and drop it on some new wax. The bowl hase two rinse outlets near the top of the bowl, the water swings around the bowl when rinsing. Toto calls it their "Double Cyclone"
White, Beige and Bone come with the super smooth ion barrier glazing that they call Sanagloss. I have a bowl downstairs with the same glazing that is 2.5 years old, and it's still very smooth, like the day it was installed. Inside the tank of the MS604 Ultramax II. It uses the Red Toto 3" flapper, replacements are found at most hardware stores. The fill valve prevents overfilling of the bowl. Does anyone have any updated reviews or comments on the 1 piece Gwyneth (with or without Sanagloss). I am very close to purchasing 3 of them for my home reno and just want to make sure that they are as fantastic as they appear to be. Have had our two Gwyneths since June (Sanagloss) and have had no clogs or problems. One does need to be sure to push the flush lever down completely (no need to hold there, though) as an incomplete push can result in an incomplete flush. Expect that's the same with all toilets. I really like the look, too. And if you have any concerns about the seat shape - one gets accustomed to it very quickly and I now prefer it to the flat seat on our 1 remaining waterhog toilet. Had some doubts prior to purchasing. 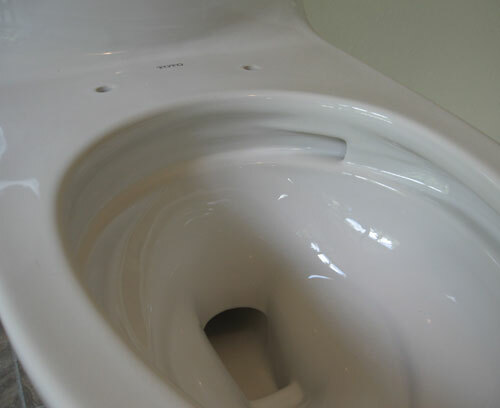 Should have added that the bowl stays much cleaner than on our old regular style toilets (with the numerous holes under the rim). We'd get mucky buildup quite quickly on the old toilet and that just isn't happening now - maybe in part because these are NEW toilets. But swirling action of the double cyclone and having just the two openings under the rim is definitely good. What are the advantages of this one over Toto EcoDrake besides Sani-gloss and Cyclone flush? I really like my EcoDrake and I'm trying to decide what to use in my other bathroom. SanaGlos is super smooth so things have more difficulty sticking and rinse off easier. It also has some antimicrobial properties. Personaly, I think it is a good choice. Some other companies offer similar finishes, but I haven't compared them. I know Duravit makes one they call Wondergloss (or something like that). Most toilets sold in Japan have similar finishes. There probably aren't advantages for the Gwyneth over the Eco Drake if easier cleaning isn't important to you and you don't need a one piece. Maybe you aren't the one who has to do the cleaning! For me one important advantage of the Gwyneth was that it has about the shortest overall toilet height of the toilets with ADA height bowls - I had to contend with a banjo counter. But if height isn't a concern then there are more options. For my 3rd bathroom (basement) I would probably consider the Eco Drake, even with the possibility of more cleaning needed, just because I don't have the banjo counter there and the cost is much less. With a good MaP rating. I've been using a Gwyneth one-piece for a few months now. The water in the bowl is pretty similar to the Drake and Ultramax, except that there is a bit less volume in the bowl. The flush is pretty quick and rinses fairly well. The comfort height is nice. I installed a two piece Gwyneth a week ago and it is working fine. The first Gwyneth I purchased was not flat on the bottom and caused it to rock. I took it back and got a new one. This one was perfect. The install went well. The first flush caused a gush of water to shoot out of the bowl and hit the wall. That made me worry. But after that initial flush, it has worked fine. The flush is very fast and the tank fill time is probably about 30 seconds. Much faster than the old toilet. The only problem I had was tightening the tank bolts. There are three tabs on the back of the bowl that are supposed to touch the tank when everything has been installed. I tightened the two tank bolts as far as I felt comfortable but there was still about a 1/16" gap on the left front tab. I am afraid to tighten it any further for fear of braking the tank. 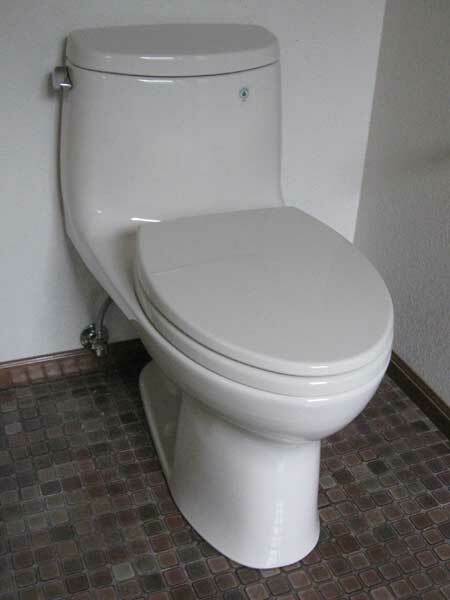 This is exactly why I would opt for a one piece toilet if I had room to maneuver around to install it. I am very glad I purchased a Toto toilet. Much more expensive than the standard toilets but it shows in the quality of the toilet. I don't even look at the tabs. I tighten until it feels right. I ran across your site today and have been studying it. I'm interested in the Gwyneth two-piece. You don't have any reviews yet, but I'm interested in it because I'm in the LA area. Do you think the Gwyneth might flush as well or better as my standard Kohler 1.6 from Home Depot a few years ago? Also, is there a reason that you cannot ship the CST454CEFG to LA? I've been using the one-piece version for a while, and the two-piece is supposed to work even a little better. I just had the two piece Gwyneth sanigloss ADA height (model CST 45CEF) installed, replacing a lovely water hog 1926 American Standard Devoro (not baby Devoro) with a hairline crack in the base. The flush on the Gwineth is awesome, and it handles the large masses as advertised. I selected this after much lurking on the website. The slow close lid is fun too. We had to re-pipe the fill line because the old toilet fill line came in at the top of the tank, not the bottom as in modern toilets. We are now noticing a sewer like odor or a urine odor when the bathroom door is closed (no interior fan yet). I wanted a second opinion before I called the plumber in for a smoke test. Maybe try a new wax ring? 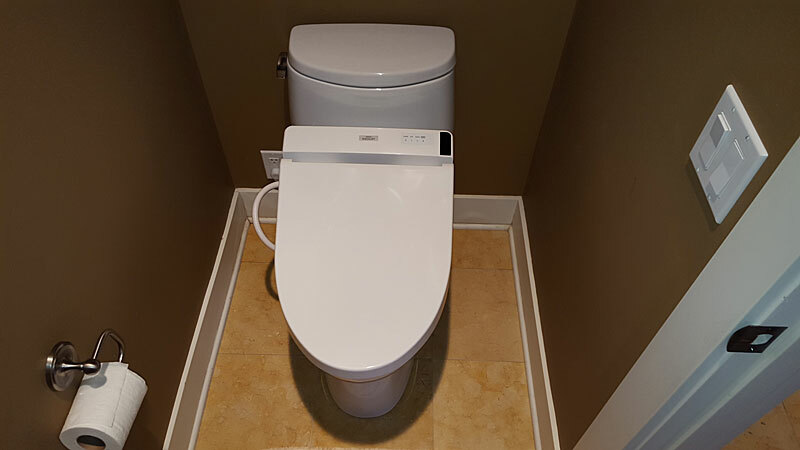 It is possible that when you installed the toilet, the seal provided by the compressed wax ring was broken, allowing sewer gases to seap back into the bathroom from the sewer drain pipe. 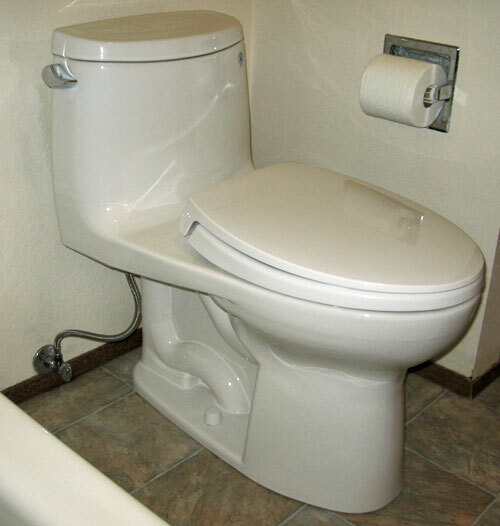 Have you noticed any water leaking around the base of the toilet? Am curious why the Gwyneth did not make your list of recommendations for toilets "that work in today's world". We just bought one (not installed yet) and now have second thoughts about it as it's not on your list at terrylove.com/crtoilet.htm. Which would you say is your favorite Toto 1.28 gpf (considering performance, price, and ease of parts replacement for a DIYer), the EcoUltramax? P.S. Thanks for the great website and forum. The Gwyneth works fine. I need to update the list. I ended up purchasing 3 Gwyneth once piece toilets and we absolutely LOVE them! The universal height is great...except now when i use someone else's toilet it always seems so low! lol The Sanagloss is good and the double cyclone flush cleans very well most times however sometimes you do need to use the brush a bit. 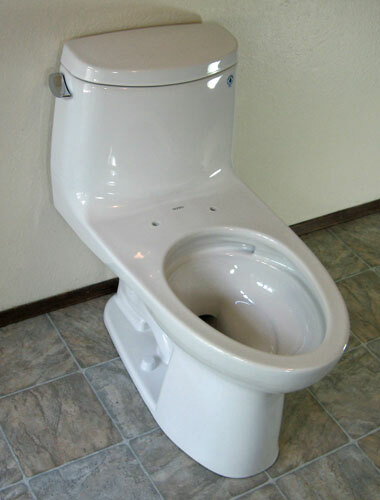 My only minor complaint would be that the flush is a little bit noisy but only for a second so no big deal. Are the fill valve and flush valve on the one and two-piece Gwyneths replaceable with the Korky parts from Lowe's? Toto uses a few different valve manufacturers. One of them is Korky. While you can replace the normal wear part on the Korky supplied versions (cap assembly and flapper) with their parts stocked at Lowes. You may not want to replace the whole valve assembly (not normally necessary anyway). It will work, but they have them made with a custom restrictor to get the bowl to tank water ratio just right to minimize any excess water use dumped down the drain into the bowl. 1) So how does the bowl rinse of the Gwyneth 1.28 gpf double-cyclone compare to the bowl rinse of the Guinevere/Soiree 1.6 gpf double-cyclone? Is it noticeably different? 2) Would you say the bowl rinse of the Gwyneth 1.28 gpf double-cyclone is better than the bowl rinse of the Drake 1.6 GMAX? So where would you rank it?